Which is Best entry-level DSLR Camera? DSLR cameras are the ideal choice for any photographer who wants to take his craft to the next level. There are offers for both beginners and professional photographers depending on your level of experience and budget. DSLR cameras for photographers come with interchangeable lenses, manual controls plus an outstanding picture quality. These cameras come with a viewfinder and are the best choice for the press, wildlife, and sports photographers. They are slightly bigger than mirrorless cameras but offer excellent quality. You always get your photographs crystal clear when you use this kind of camera. If you are a beginner photographer looking forward to buying your first camera or are an experienced cameraman who needs to make a replacement, this guide is here to help you. Here is our selection of the best DSLR cameras for both beginners and professionals. Check out the cameras we have reviewed to help you make the right choice. Check out our compilation of the best entry-level DSLR camera reviews. Read about what each brand of the camera offers to help you make your pick of the best DSLR camera for beginner photographers. Find out which one has what you are looking for and you are good to go. 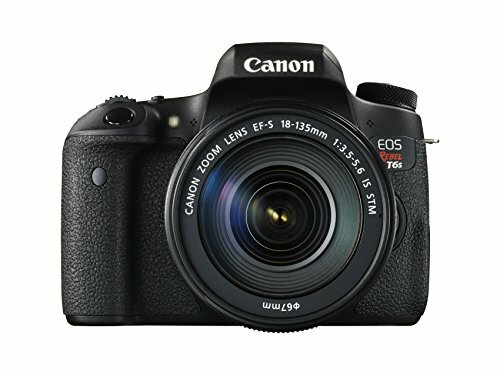 The Canon EOS Rebel T6s was made to beat the competition in the entry-level DSLR camera for beginners market. It features an upgraded 24.2 MP APS-C CMOS from 18MP of its predecessor T5i. It goes on to include new 7560 pixels RGB + IR metering sensor which makes better metering and skin tone detection. The Rebel T6s comes with new Hybrid CMOS AF III sensor based phase detection to give enhanced focus speed at 19-point plus accuracy during live view. This entry-level DSLR camera enables Servo AF during live view which makes it possible to track moving objects when shooting in live view. With a top 3-inch touchscreen LCD monitor, you will be able to access a quick dial on the rear and make 5fps continuous shooting. There is also an eye sensor to shut off the LCD monitor while shooting through the viewfinder. 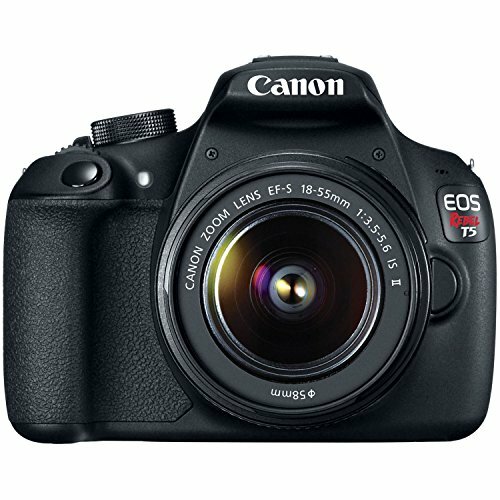 The video output from this best Canon DSLR for beginners is 1080/30 HDR movies in real time which a great feature for beginner filmmakers. It also comes with inbuilt Wi-Fi to enable uploading images to the cloud or for remote control using smart devices. The Canon T6s has nice features aimed at giving users their money’s worth. It comes with top plate LCD information display which is a good thing for an entry-level DSLR camera for beginner photographers. The Servo AF during Live View is a great feature which makes it possible for continuous AF in burst mode. The Nikon D5500 is a good choice for photographers who require a compact entry-level DSLR which is incredibly 15% less in weight than its predecessor the Nikon D5300. 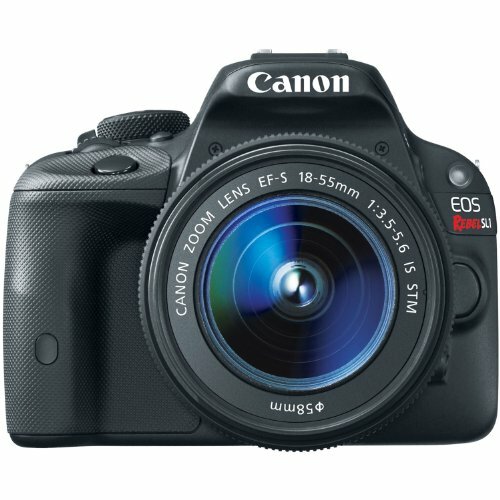 It offers good image quality, a flip-out LCD with a feature set making it one of the best DSLR cameras for beginners. Get prepared for a superb menu system with live view performance which makes navigation a lot easier. The Nikon D5500 comes with a smaller and lighter body having an improved grip which is easier to hold. With a faster processor, a touch-enabled 3.2 inch LCD you get a ‘flat’ picture which can be shared with the inbuilt Wi-Fi. The ‘flat’ picture control makes it easy for color grading during post-production. One of the entry-level cameras, the Nikon D5500 is a great improvement from the earlier Nikon D5300 model. The camera has a sensitivity range of ISO 100-25,600 with 5fps continuous shooting. You get 1080/60p video with clean output through HDMI. One thing missing from this version is the built-in GPS which the D5300 featured. However, with a smartphone app, you can easily get geotagging on your Nikon D5500. If you are a fan of Nikon, this is one of the greatest cameras for beginners. It comes with a lighter body, a better hand grip and a 35% improved battery life. Get snapping away without fearing that your camera will go dead after a few hours. 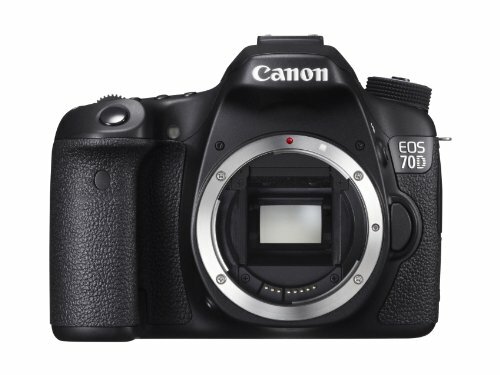 The Canon EOS 70D appeared with a progression from 3MP to 18MP and ISO 1600 to ISO 12800. It’s a mid-range camera for enthusiastic photographers and one of the best DSLR cameras for beginners. Coupled with an autofocus sensor, this camera has a superb touchscreen plus inbuilt Wi-Fi. The EOS 70D comes with a sporty new sensor and 20.2 MP resolutions. This Canon DSLR camera for beginners uses a ‘Dual Pixel CMOS AF’ design where each pixel is split into two photodiodes which are read separately to face left and right. In principle, this camera has ability of phase detection autofocus in movie mode and live view the best ever seen in any camera. You can make shots continuously at 7FPS for up to 65 frames in formats like JPEG or 16 in Raw. Covering a range of 100-12800, the EOS 70D has an ISO 25600 expanded option. This camera has 1080p30 video quality and records audio through an external mic. This camera gives the best live view for an entry level DSLR camera. You get 1040k dot 3 inch ClearView II LCD with 3:2 aspect ratio. It has a built-in flash which doubles as an off-camera remote flash controller. Nothing beats its ‘Creative Filter’ image processing with the previewed live view. The Nikon D5300 offer a 24MP sensor, a rear LCD and it’s much lighter and smaller than the Nikon D5200. With a beefed-up video mode, this camera is capable of producing 1080/60p HD videos. This Nikon entry level DSLR camera for beginners is a great equipment for photographers and videographers alike. The Nikon D5300 is an interactive updated model with features like a widened 3.2 inch articulated 1.04 million-dot LCD screen. It comes with inbuilt GPS and Wi-Fi, a first for Nikon best entry-level DSLR for beginners. With more battery life, you can take 600 shots compared to 500 offered by the Nikon D5200. This is a stronger camera with 5fps continuous shooting, a built-in stereo mic, and EXPEED 4 processing. On the low side, this camera comes lacking the twin-dial interface and professional AF grade system which is available on the lower Nikon D5100. It also lacks an anti-aliasing filter and a touch screen but makes up with a higher resolution for better picture quality. The Nikon D5300 comes fully loaded with ISO 100-12.800 standard expanded up to 25,600 and with a 2016-pixel RGB metering sensor. With a 1.04M dot 3.2 inch vari-angle monitor and 9 cross-type sensors, this is a great choice as an entry level DSLR camera for photographers. 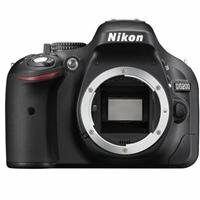 The Nikon D5200 is an entry-level DSLR camera with amazing specs. It comes with 5fps continuous shooting speed and full HD video capability. This camera has a 60i capture rate with a built-in mic included. The Nikon D5200 comes with 39 points Multi-Cam 4800 system making it a good entry level camera for beginners. This camera uses SD/SDHC/SDXC memory card storage from brands like Panasonic, SanDisk, and Lexer. Its 3 inch LCD monitor can swing in 180 ˚ and has a dot composition of 921,000 which can be adjusted to seven levels of brightness. The viewfinder for this entry level DSLR camera for beginners has a diopter adjustment responsible for variations in eyesight acuity degree. It further gives 95% coverage of both vertical and horizontal planes where the captured image will have edges of objects not visible when the image is being composed. It has a sensor with a horizontal measurement of 23.5mm and a processor with EXPEED 3. An upgrade from the Nikon D5100, this entry-level DSLR camera will not disappoint. Nikon put more pixels into its sensor to give you more picture quality and improved the user experience. This camera comes with a rechargeable Li-on battery with a charge and CD-ROM software. Other perks include a user manual, rubber eyecup, USB and A/V cables and a strap. The Nikon D3400 is a beginner DSLR camera which delivers very good image and video quality with speed. It comes with enhancements from its predecessor the D3300. The D3400 comes with a new sensor to deliver sharper photos in low light for an entry-level camera. The Nikon D3400 thanks to the AF-P lenses has faster and smoother autofocus when shooting videos to make them better. It can enable continuous shooting because it is fast when shooting and focusing. This beginner DSLR camera has an LCD monitor which enable optimized shooting with the new lens kit. Nikon offers two versions of kit lenses for this camera model, the 8-15mm VR lens and the dual-lens kit with VR version of 18-55mm. On the low end, this camera has some annoyances like its tiny autofocus points in the viewfinder. Ii also lacks an efficient self-timer mode and offers only Bluetooth for wireless connectivity which is not good for most users. The Nikon D3400 is one of the best DSLR cameras for beginners with its high-quality videos and photos. The performance of this entry-level DSLR camera is fast enough to capture kids and pets. So, it’s a good choice for travel photographers because of its continuous shooting when capturing moving objects. The Canon EOS Rebel T5i is a flagship in the Rebel line range of entry-level DSLR cameras. It comes with a remodeled hybrid CMOS AF system to accommodate the latest STM lenses on the market. The lenses use the stepping motor technology to do away with autofocusing sounds through silent tracking of the subject. The Rebel T5i comes with a better mode dial with scene modes during live view. The ‘real time’ viewing of creative filters is a great asset to this entry-level DSLR camera for beginners. You can make all adjustments during exposure instead of processing after taking the image. This Canon DSLR camera for beginners has a digital zoom available in movie mode. It has a touchscreen LCD monitor for setting one-page menu functions, ISO, image size, metering method, flash configuration and picture style setting. Its shutter is incorporated into monitor operations accessible by pressing the live view button. You will love the remote sensor located in the hand grip which enables wireless remote operations. The T5i has Scene Intelligent Auto which allows automatic scene analyzation and captures full HD NTSC video at 1920 x 1080 with 30 or 24 frames each second. This camera lacks a weather sealing and its clip highlights more often. The Nikon D3300 camera is a high-performance entry-level DSLR camera for beginners with a high resolution despite its low price. It comes with optical anti-aliasing filter replaced in favor of optimal sharpness. This relies on big megapixel counts which cope with any moiré-causing patterns. The Nikon D3300 has a high-resolution sensor which captures every possible detail which makes it a good DSLR camera for beginners. It has EXPEED 4 image process engine with a faster processor for an entry-level camera. Its ISO sensitivity is an impressive 25,600 with a shooting range 5fps which is very impressive for an entry-level DSLR camera. You will enjoy its new flash modes including an option for flash fill. This camera, however, lacks built-in Wi-Fi, you will have to fork out some extra bucks if you need to use this function. It also has high image noise and kit lens which requires awkward manual focusing. This does not stop the Nikon D3300 from being an incredible camera for beginner photographers, with has a few additional extras including shooting modes like a Rangefinder Mode, Mirror Lock-up, Effects Mode, Selective Color, and Easy Panorama. 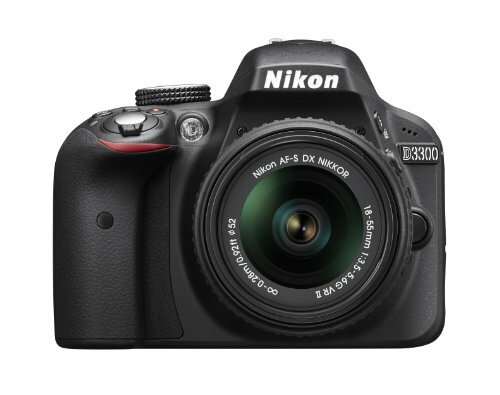 Nikon D3300 will give you excellent value and high resolution at a price. With a simple design, it’s quick and intuitive to operate. It has easy-to-locate direct-access buttons for functions like flash setting. Image setting is accessible on the menu located on the rear display for improved usability of this entry-level DSLR camera. The Canon EOS Rebel SL1 is an easy-to-use DSLR entry level camera for beginner photographers. This is the lightest DSLR camera to be released be Canon to compete with mirrorless cameras. It comes with a built-in flash and a full megapixel APS-C image sensor. The Rebel SL1 has an optical viewfinder with an off-sensor phased detect autofocus system to cover 80% of the frame. This model provides full DSLR for beginner experience with adequate performance. You get all that at an attractive price in a compact body. This camera is truly lightweight cutting, shaving off a quarter a pound from its predecessor the Rebel T5i. This one has a much more petite form factor. Though it has reduced controls, you will be able to access the menu with just one or two button presses. Lacking an LCD monitor is not a big deal on this entry-level DSLR, the SL1 makes up for it with touchscreen functionality. You will be able to get adequate image quality through ISO 160 or ISO 32000 if you apply noise reduction. Are you a fan of traditional DSLR cameras? This one will suit you just fine. The Rebel SL1 model is compelling as a mid-range option for its shape and feel. It has very accurate color rendition and acceptable dynamic range for best DSLR camera for beginners. The Sony Alpha a6000 is a mirrorless camera which comes with an upgraded resolution and processor from other models like the Sony Nex-6. It has an update of Hybrid AF- system with 179 phase – detect points. These give 92% coverage, the most comprehensive of any mirrorless entry-level DSLR camera. The Sony Alpha a6000 utilizes the new Bionz X processor to shoot continuously at 11 fps with subject tracking. This model has the fastest AF performance on the best DSLR camera for beginners’ list. With a built-in flash and multi-interface shoe, this camera has a 3-inch tilting LCD with 921,600 dots. It has diffraction correction with detail reproduction technology and area-specific noise reduction. The output is clean HDMI with full HD video 1080/60p for a beginner DSLR camera. You can make use of its inbuilt Wi-Fi to remote control this mirrorless camera from a smart device. Images can be transferred or uploaded to the cloud using Wi-Fi connectivity which is a big plus. A major setback on this model is that it uses Sony’s lower resolution SVGA viewfinder. It also does away with the NEX-6’s level gauge in order to cut on costs making the Alpha a6000 a lot cheaper. 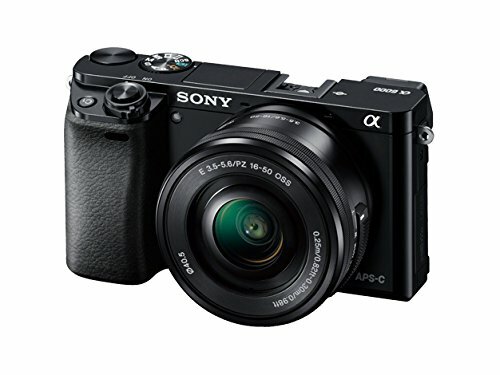 The Sony a6000 comes with new significant features making it stand out as a good entry level DSLR camera for beginners. This mirrorless DSLR camera has the fastest AF performance when shooting continuously coupled with a 24.3 megapixel Exmor APS-C CMOS sensor. You get a wider area for phase detection autofocus to track moving objects. Ever wondered how all those nice shots professional photographers take to come about? As a photography enthusiast, a good DSLR camera is an essential tool of the trade. It would capture details and situations to make your journey to professional photography easier. This guide is to help beginner photographers get great results with the use of a good DSLR camera option. When buying a DSLR camera, look for one which is pocket-friendly. It’s crucial that you make two budgets, one for the purchase of the camera and another for accessories. Do not go for a camera which will leave you with creditors on your heels. A better DSLR for beginner camera is easy to use even without prior experience with cameras. Look for a camera you can operate with ease and can troubleshoot within a few minutes. Others come with a user guide to enhance end-user experience. A DSLR camera with guide mode helps a beginner to familiarize with the controls and settings. The kind of camera is easy for an inexperienced photographer to understand better how to come up with certain kinds of images. Will you be able to share images and videos with ease after capture? This is an important question when selecting a DSLR camera to buy. Some cameras come with inbuilt Wi-Fi, Bluetooth or ports through which data is removed from the camera. These features can also be applied for other purposes such as remote controlling the camera flash with a remote controlled smart device. A camera with good speed is a great asset to any budding photography enthusiast. Whether you are taking photos of your kids, speed is essential to capture all those little moments. Camera speed is determined by its burst speed including the number of images you can shoot per second if you continue holding the shutter release. The more images a camera captures in a second the clearer the image quality. An average DSLR camera takes 5 photos per second. Having no experience with DSLR cameras leaves you with no option but to rely on recommendations from friends on what camera to buy. If you are surrounded by people who use a particular brand, it’s a good decision to buy the same. You will able to get assistance from them when you have questions and loan accessories from each other. Hope this guide will help in making a good decision on the right kind of DSLR camera to purchase as a beginner. This is an important process since disappointments at this stage may destroy your desire for professional photography. A seamlessly easy beginning with DSLRs will leave you yearning for more experience a photographer.